You can start in Newfoundland with a celebrity: the miniature Victorian railroad station just off County Road #513. It played a starring role in the much-praised independent film, The Station Agent. So it’s no surprise that it’s one of the first things some visitors want to see. But as intriguing as the little frame station with the red trim and blue door is, to imagine it as the heart of Newfoundland would lead you in the wrong direction. 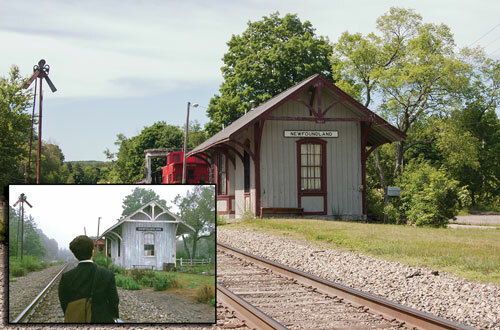 The Newfoundland railroad station needed little make-up to set a rural scene for the movie The Station Agent. The film was written and directed by New Providence native Thomas McCarthy, and starred Peter Dinklage who was born in Morristown and raised in Mendham. Railfans will recognize dozens of other local sites in the film. The station, after all, is an emblem of civilization. And while Newfoundland (locally pronounced New-found-land) lies by road and track about forty miles from Manhattan and is roughly bisected by busy Route 23, civilization is not what defines it. Actually, the opposite. A century after the New York, Susquehanna & Western Railway built the station and long after passenger trains on the line stopped running by it, much of the surrounding area remains a remote place, oddly immune from the still growing suburbs long nipping its borders. The Pequannock Watershed, which weaves through and around Newfoundland lands, has been called “one of the New Jersey’s last wilderness areas,” by David Epstein, executive director of The Land Conservancy of New Jersey. To call it wild might seem exaggeration, and yet, with an extraordinary amount of land undeveloped and restricted, the word applies. A swath of forest crisscrossed by trails, some rough or unpaved roads, occasionally punctuated by development, Newfoundland territory is familiar in places; rugged in others. The reason, it turns out, is water. At the turn of the century, residents in Newark were falling ill and dying from drinking bacteria infested water from the polluted Passaic River. Finding clean water to the northwest, the City of Newark locked up acres and acres of land there, taking much of the territory by eminent domain, and establishing the Newark Watershed. In the process, it protected and preserved deep forests, brooks, ponds and unspoiled landscapes surrounding the water’s source. The result? Miles of trails up, down, and around a mini-range of mountains, through woods, past rocky streams, still lakes and reservoirs, with glimpses of the ruins of a stone castle and abandoned iron mines, all framed by harsh glacier shears, sliced by the Wisconsin Glacier ages ago. West Milford Township, of which Newfoundland is a section, bills itself as the “Heart of the Highlands.” The majority (two thirds) of its land is off limits for development. 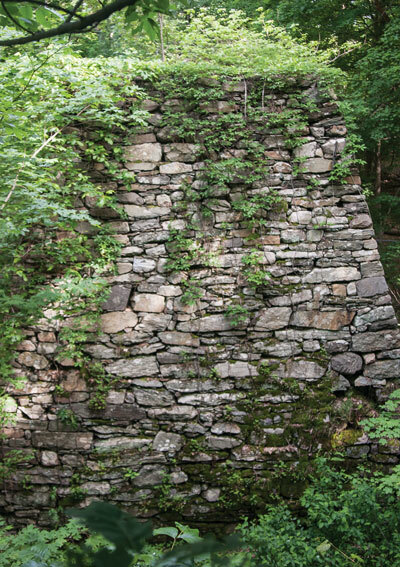 Newfoundland encompasses some of West Milford’s most protected territory, whose lakes, streams, and woods invite exploration and contemplation, and where abandoned ruins and relics create an other-worldly outdoor experience. It sits within and beside 35,000 acres of Watershed lands, where encroachment is virtually prohibited. 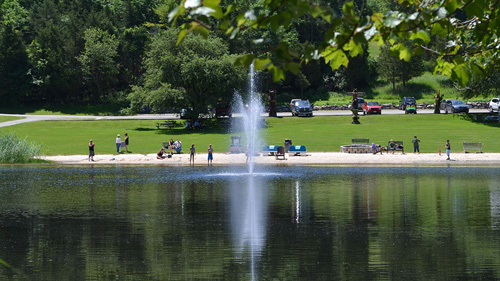 “The clear lakes, streams and ponds, the mountains with their dramatic rock outcroppings, the forests all combine to make the Pequannock Watershed one of the most scenic areas in New Jersey,” notes the New York/New Jersey Trail Conference in its guide to the area, where trails are maintained with the help of Conference volunteers. To enjoy it, all that is needed is a permit, a plan and an adventurous spirit. You can tackle the trails on foot, fish, paddle or boat on rivers, lakes and reservoirs; or ride your own horse (or a hired one). Once you’ve secured a steed, put on your backpack or trailered your boat to a launch, all you’ll need is a season or day permit (easily obtained through the Newark Watershed Permit Office at 223 Echo Lake Road, Newfoundland). Required for hiking, fishing, riding or hunting on Watershed lands, permits are reasonably priced, with discounts for Newark residents or seniors, ranging from $34.50 ($21 for Newark residents) for horseback riding to $25 ($14 for Newark residents) for fishing. Licenses are also available at the Watershed office, as is a recently configured map of the Watershed, showing trails, parking, landmarks, and permit requirements. One gateway to the network is Four Bird Trail­; named for osprey, wild turkey, red tail hawk, and great blue heron common in the area. With a trailhead just steps from the little railroad station by County Road #513 and south of Route 23, it loops for miles down to Split Rock Reservoir, which sends its water to Newark’s neighbor, Jersey City. This trail heads east off Clinton Road. 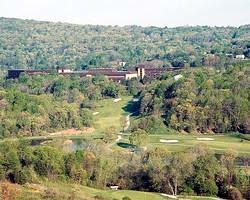 Hikers can access Bearfort Mountain, Buckabear Mountain and Pond, and the Highlands Trail. Hiking in Newark’s Pequannock Watershed is by permit only. 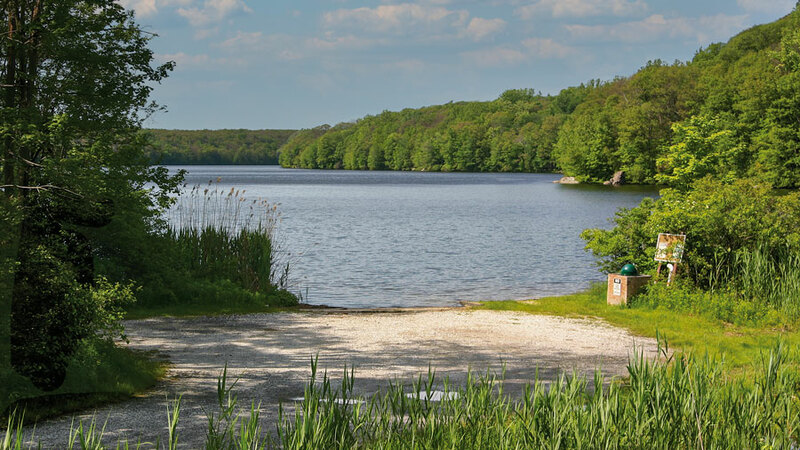 Another entry can be found at the intersection of Clinton Road and Van Orden Road, north of Route 23 near the southern side of the Clinton Reservoir, providing access to more than twenty-four miles of trails (outlined in the New York/ New Jersey Trail Conference's NJ Trails Map). 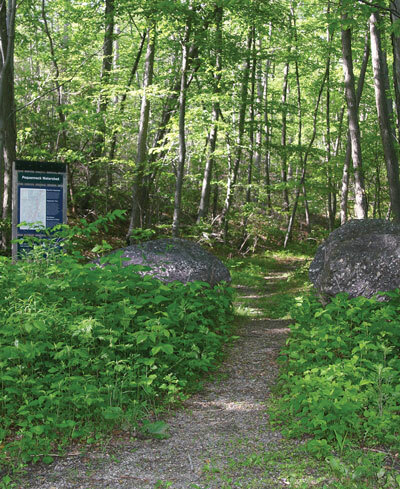 These eventually may connect to the much larger, interstate Highlands Trail (no single map covers it), an old trail, new trail, road walk combination, which, when completed, should lead trekkers from the Connecticut border, more than 150 miles all the way to the Delaware River. 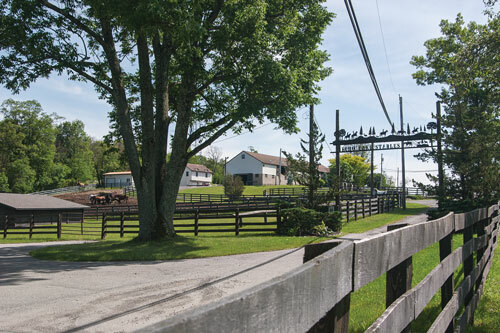 You can also take to trails on horseback, starting out from Echo Lake Stables, on Blakely Road, just off Echo Lake Road, where horses and trails are “easy going,” according to owner Kathy Leaver, and the scenery unspoiled. “You’ll think you’re in Montana,” she says. To experience Newfoundland territory after dark, make arrangements for an evening ride from the stables (by reservation and cash only), which includes an hour and a half ride, a bonfire, music, and simple barbecue with hotdogs, hamburgers, marshmallows for roasting, soda and water (beer and wine permitted at the rider’s own risk). An odd shape, Newfoundland, which has its own post office and zip code (one former resident recalls that into the 1970s mail was only delivered three days a week) dives in a narrow stretch southwest of Route 23, with a wider shorter portion arcing north of the highway. Green Pond, home to a private residential community, sits on Newfoundland’s southwestern end, Echo Lake, a Watershed reservoir, stands to the north. While Echo Lake draws mainly fishermen now, nearly a century ago, not yet a reservoir, it was more business than recreation; producing tons of ice for area iceboxes, with storage in an ice house no longer standing. 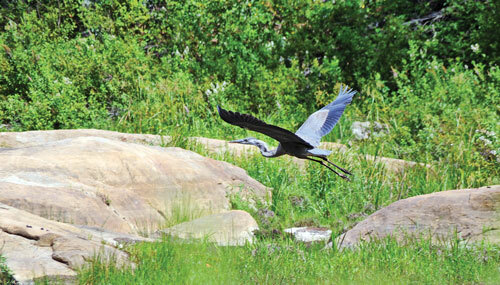 “It’s a beautiful area, and it should stay that way, “says Ross Kushner, Executive Director of the Pequannock River Coalition, who has logged twenty years fighting for protection of the area. Describing himself as an “angler”, among his priorities is the purity of Pequannock River water. He points out that it is now a New Jersey Department of Environmental Protection Category One waterway, the cleanest and most monitored designation, providing drinkable water as well as a hospitable home for wild trout. The Coalition not only advocates regularly for the river, but also gives the public a chance to experience the river first hand through its guided paddling trips. Newfoundland’s rivers, stocked lakes and reservoirs offer up not only trout, but bass, catfish, walleyed pike and, especially in Echo Lake, the fierce and hefty muskellunge, a.k.a. “musky,” for catch and release. Belonging to the pike family, muskies are known to grow to enormous proportions. (The lake’s record catch size is more than forty pounds). The muskellunge, whose jaw differentiates it, was named by Native Americans with a word that meant “ugly fish.” Its markings range from “clear” to “spotted,” to “barred.” (The hybrid “tiger” muskie, with both spots and stripes, does not make its home in Newfoundland waters.) It has a reputation for being hard to catch and aggressive, attacking and eating not only its own and other fish, but also mice, snakes and waterbirds. Newfoundland waters and woods also are home to wild turkey, deer, beaver, river otter, elusive bobcat, plentiful bear, whose numbers appear to be growing, and the occasional timber rattlesnake. Hikers are advised to familiarize themselves with how to avoid and handle encounters with any animals or reptiles on the trails. (An exceedingly rare fatal encounter with a bear occurred on a nearby trail last year). Like the Pequannock River Coalition, the Land Conservancy of New Jersey has made the Watershed’s protection a priority, working to save critical pockets of privately held land from development. It recently acquired two parcels, one sixty acres, the other 189 acres near Newfoundland, which form the Pequannock Watershed Preserve, a land trust. Land Preservation Director Sandy Urgo, who headed the project, describes the forest there as “very undeveloped and very pristine” and unusually free of the heavy deer browsing damage and invasive plant species that have marred other area forests. She attributes that partly to hunting, but also to watershed’s vast nature and limited intrusion. With such rich natural attractions, it’s no wonder that during the railroad age, when passenger trains ran from New York, the area drew its share of wealthy and well-known admirers, from Thomas Edison, who reportedly stayed at the imposing Idylease Inn, to Richard Cross, a New York City banker, who constructed his stone castle just after the turn of the century, now really a shadow of a ruin, deep in the Newfoundland woods. Listed on the National Register of Historic Places, the Clinton Furnace is all that remains of the 19th Century iron-making community. The furnace, which ceased operations in 1852, is currently fenced off to prevent any entrance or liability for potential injury. Even earlier, beginning just before the Civil War, stagecoaches lurched up from Paterson en route to Dekertown (which became Sussex just after the turn of the century), leaving at 10 a.m. and reaching the little station and the elaborate, rambling Brown’s Hotel in Newfoundland roughly four hours later. One historic account has drivers accompanied by a “gun-toting companion.” The Brown’s Hotel is long gone, but its bandstand remains. The miles were long then, and inhabitants scarce; Peter Brown, the hotel’s owner, married Elizabeth Kanouse from Boonton Township. She was the descendant of Dutch immigrants who came to the area in 1720. The American flag flying atop Kanouse Mountain, at a little over 1,000 feet, makes it easy to recognize, with Mount Newfoundland, Green Pond and Copperas Mountains in the distance. Despite modest elevations, Newfoundlands’ “mountains” played a role in early days of the state’s ski industry. South of the railroad tracks and Route 23, Hugo Meury and Helen Craig opened Craigmeur (naming it by combining parts of their last names), in the early days of American skiing. Credited with being an industry pioneer with its rope tow and later lighted night skiing, the area, opened in the 1930s, finally closed in 1998, done in by competition from larger Sussex County ski resorts and unreliable winter weather. Owned by a family and geared toward families, Craigmeur is remembered by generations of northwest New Jerseyans as the site of their first “bunny hill” run and after-school ski trips. The Morris County Parks Commission bought the property in 2005, making it available for picnics and other special events. The facility offers basketball, bocce, horseshoes and volleyball courts. Future plans for it have yet to be announced. Of course, no permit is required to see what remains of Newfoundland’s vintage architecture, not only the station, but also the Idylease Inn (now a rooming house) easily viewed from the roadside. They recall a turn of the century culture when the area’s remote location convinced disease wary city dwellers that visiting would be good for their mental and physical health. 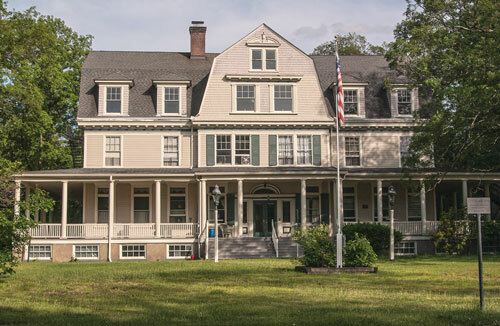 The Idylease Inn, a former a health resort, is now a rooming house easily viewed from the roadside at 124 Union Valley Road. The Idylease, with its prominent central gable, was opened in 1902 by a Brooklyn doctor and billed as “a modern health resort, delightful in autumn.” Visitors described it as a haven of rest” whose “masseuses are among the best in the country” and where fine meals were served either in the dining room or at their bedside. It evidently attracted some prominent people, including Edison and Joseph French Johnson Dean of New York University’s School of Commerce, who hoped to salve his ill health but died there on January 19, 1925. The lawn at the Idylease, once a place where bonneted ladies and jacketed gentlemen relaxed and played croquet, now serves as a launching pad for medivac helicopters, under the supervision of the West Milford Police Department. 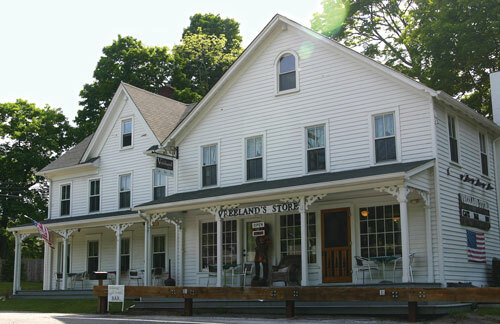 The Vreeland Store, on Macopin Road, welcomes visitors to West Milford. Whether exploring the mountains, forests, rivers or lakes, at the end of the day, a visit to the historic Vreeland Store and Inn for a drink and a dish in its cozy/artsy cafe softens the return to civilization. Restored and run by the Lanza family, this stylish roadhouse, just down the road from Newfoundland’s natural attractions, serves everything from breakfast sandwiches to tapas (duck/bacon mac and cheese is a chef’s favorite) in its dining room, bar, or on its welcoming front porch. Full of books, its walls papered with vintage photos, posters and newspaper clippings and displaying the store’s original safe and ancient cigarette machine for atmosphere, the Vreeland Store also showcases for work by local photographers and artists. For those for whom just one day on the trails or waters is not enough, the Store offers B&B style overnight accommodations: two upstairs suites, each with a bedroom and sitting room and pull-out queen bed—enough room for a family of hikers, riders, fishermen, or anyone in need of that more than century old Newfoundland specialty: a complete retreat. Celebrating ten fantastic years in our Branchville location, this family-owned authentic Mexican restaurant offers all your favorites with a few surprises, expertly prepared and exquisitely presented. 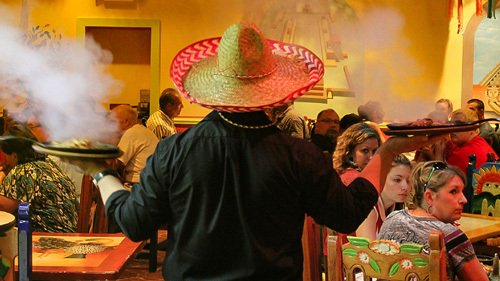 Come enjoy a fun and exciting dining experience here, at our other fine-dining location in Rockaway, or at our Taqueria in Morris Plains and the Rockaway Mall. Bienvenido!